Here at the Museum of SuperNatural History, we’ve always wondered what became of all of those chimpanzees that NASA blasted off into space. Well, the official response word is that apparently, just like everyone else, they’ve retried to Florida. Astronauts Scott Carpenter and Robert Crippen, two heroes of the U.S. space program, paid a visit to a retirement home in Florida for “The Space Chimps” - veteran chimpanzees who had participated in early test flights by NASA and the U.S. military. “We’re paying them back for their service,” said Carpenter, one of NASA’s original Mercury Seven astronauts and the second American to orbit the Earth. He toured the sanctuary with Crippen, who piloted Columbia on the first space shuttle flight in 1981. The chimps were invaluable in helping NASA scientists suss out what dangers the astronauts might face once they were in orbit. 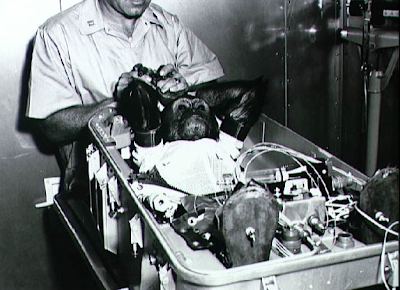 The first chimp, named Ham, blasted off for outer-space on January 31st, 1961. Sadly, most chimps lived in laboratory cages until they came to the sanctuary. Now they live in family groups of about 25 to each island, where they roam in enclosures. Several unoccupied islands sit ready for the arrival of another 150 former research chimps that will eventually retire here.